This pretty cardigan is gently shaped at the waist for a flattering fit. The delicate lace detail adds to the flared effect at the bottom edge and sleeves. The cardigan is worked from the bottom up in one piece to the armholes. A delicate button band and small buttons provide a neat finish. 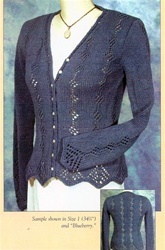 Recommended for intermediate knitters. The pattern calls for Fiddlesticks Silk Sensation which is approximately sport weight, 125 yards/50 g. Gauge is 19 st/30 rows = 4" on US 4 needles. Try Louet Gems Sport weight merino, Euroflax 14/4, Reynolds' Soft Sea Wool, or any non-fuzzy sport weight yarn.